Anyone remember the long ago discontinued Daisy Powerline 400 CO2? It may have been the first recoiling slide, self-cocking BB pistol, made in Japan. 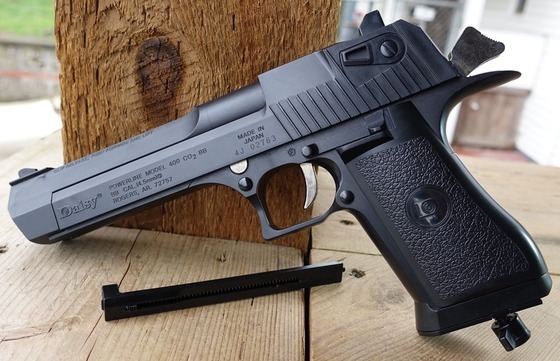 A near identical in shape and size to the famed Desert Eagle Magnum Center Fire Pistol, Daisy quickly discontinued it (claimed) because it looked too "real". I'm a gunsmith, had a Desert Eagle in .44 Mag and it DIDN'T look convincingly like the real thing. I bought a Powerline 400 when they first came out +20 years ago out of curiosity and novelty, became disenchanted (it leaked CO2 too fast between shootings) and gave it to my son. It sat around in a closet unused for 19 years and my son just gave it back. Now when I insert a fresh CO2 caplet into the grip (I put some Peloil on the CO2 puncture end) it immediately blows ALL the CO2 out the Hammer striker area. I tried again, assuming that some seals were "dry", putting a full drop of Peloil on the Puncture seat for the caplet, and no difference. Personally, I think Daisy discontinued this model because it always had a "leak" problem, as mine did from "new from the box", only slower back then. I've done some "smithing" on Airguns before for clients, I am no airgun specialist but this can't be any more difficult than a center firearm to repair. Trouble is that Daisy has no breakdown or parts diagrams for this old model except for a PDF of the manual. Daisy CS did reply that the none of the subsequent Daisy CO2 models shared any parts or seals with the 400 ... which also leads me to believe there was a design flaw with this Blowback design from the beginning. Anyone offer any insight to this issue with the major leak now, how to fix it, find or make my own seals and hopefully someone with an exploded diagram of the pistol and especially the CO2 mechanism for repairing? ?